Our first location was at #350, room 200 in the Inn of the Provinces Hotel (now the Delta Ottawa Hotel and Suites) from 1979-1981. 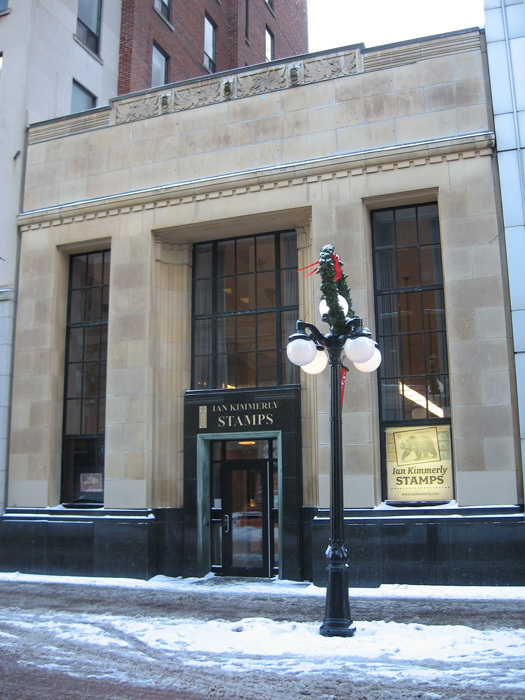 Ian Kimmerly Stamps has a long association with Sparks Street. We occupied our first street level premises at #90 Sparks, the Royal Bank of Canada Building (1984 – 89), moving to # 110 (1992 – 94), and next door to #112 (1994 – 2006). 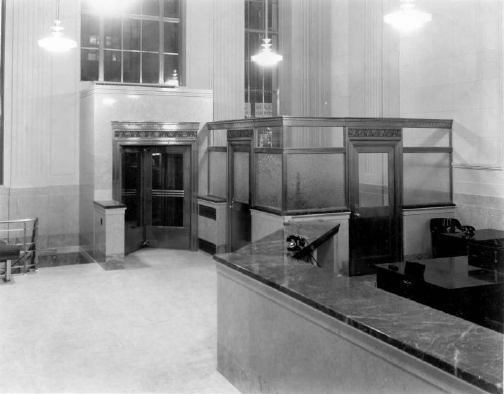 The Bank Manager’s office visible in the photos below continues to be used by Ian. We believe our premises at #62 furnish us with a location that must be the envy of many in the philatelic trade, anywhere in the world. WOW – What a location! Built in 1936-1937 as the main Ottawa branch of the Imperial Bank of Canada, 62 Sparks is a Temple-style building with Art Deco ornamentation. It has a Class One Heritage designation. After being vacant for nearly two decades Ian Kimmerly has brought commercial life back to a building and a location that has a long and important history. John Leslie (1828-1895) was the first to occupy the site as a jeweller (1869-1900). Born and raised in Aberdeen, Scotland Leslie immigrated to Canada in 1841 and settled in Bytown in1845. The village was struggling and had few inhabitants. After much thought Leslie opened a small store, advertising that he did silver repairs and sold silverware, watches, clocks and jewellery. In 1869 Leslie relocated from lower town to #25 Sparks in the now developing upper town of Ottawa (as Bytown was renamed 1st January, 1855.) This was the original number of #62 because it was originally lot 25 of the farm estate of Nicholas Sparks. Leslie Advertisement from 1885 City Directory. This impressive advertisement from the City Directory of 1885 illustrates an artist’s conception of #62, the earliest known. The text lists what could be purchased from the man who was now one of the premier jewellers in Canada. Shortly after Leslie’s death in 1895 Henry Birks and Sons acquired the firm and stock, retaining two of his long time employees. Birks continued to conduct business from #62 until 1900 when they moved to the north side of Sparks. In 1850 John Leslie purchased land from Andrew Main in an area known as Sandy Hill as it is today. It was not until 1878 that Leslie started construction of a house designed by James Mather in the Second Empire Style. The family moved into their new home at 335 Theodore Street in the Spring of 1879 and named it “Kininvie,” after the Leslie ancestral home in Scotland. This is the house where Leslie passed away peacefully in his sleep at age 82 years and seven months and in which he was waked, as was the practice of the time. Leslie’s wife Eliza died the next year and the property was sold to the Liberal Party of Canada for their leader and newly elected prime minister, Wilfred Laurier. There was no official prime minister’s residence at the time. After the death of Laurier’s wife in 1921, the residence was willed to Laurier’s successor as leader of the Party, William Lyon Mackenzie King. Today it is known as Laurier House, a National Historic Site at 335 Laurier Ave. East, and is opened to visitors. The Imperial Bank of Canada was incorporated in 1873. 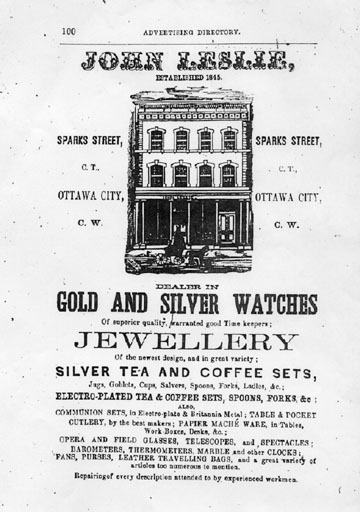 It was not until 11 July 1900 that it opened a Branch in Ottawa after making appropriate alterations to #62. Construction on the present building began in 1936. The architect is unknown but the design is considered to be Barott inspired. The late Temple-style bank building with Art Deco ornamentation was completed the next year. It is one-storey with a narrow frontage and a flat roof. The base is sheeted with polished black granite, the façade with ochre-coloured sandstone. The windows and door frames are polished metal. There are pilasters on both sides of the recessed central entrance. Decorating the top is a carved stone panel featuring three lion heads and branches of maple leaves. It is fortunate, that apart from the aluminum entrance which replaced brass doors, the present building has a well-preserved original exterior. The impressively high ceilings, the original marble decorative wainscotting, several vaults, and the Manager’s Office remain from the original interior. #62 was the Imperial’s main, and only Branch, until 1956 when it opened several more offices throughout the city. 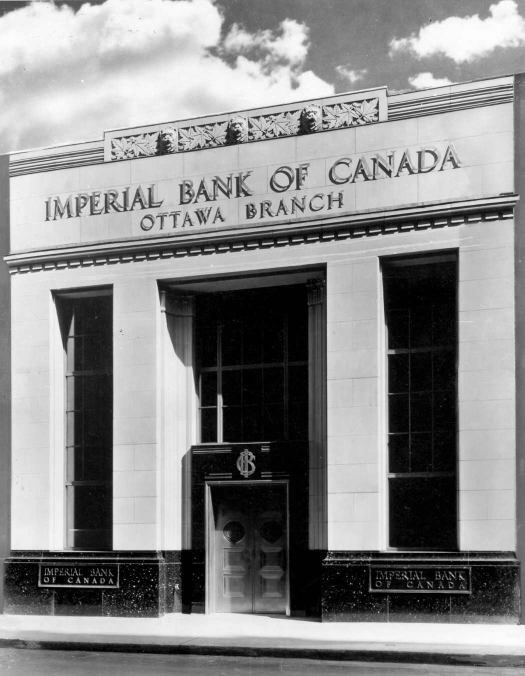 The Imperial Bank of Canada and the Canadian Bank of Commerce merged in June 1961 to form the Canadian Imperial Bank of Commerce (today commonly referred to as the CIBC.) 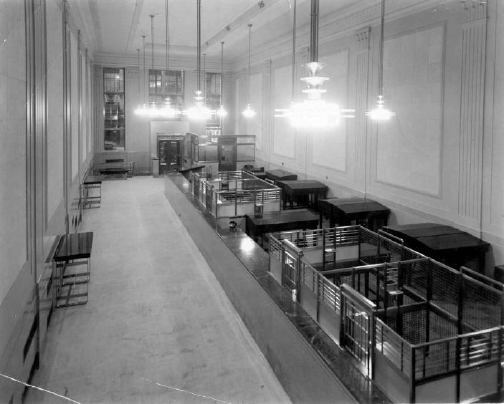 The amalgamated Bank used the former main branch of the Canadian Bank of Commerce built in 1922 at #119 Sparks Street as its main branch, as it continues to do. #62 was made a branch and operated until it was closed in 1982. For obvious reasons the CIBC did not wish to rent the building to another banking establishment. It remained vacant until a nonpublic financial institution, The Civil Service Co-operative Credit Society Ltd. (CS Co-op) rented and occupied it from 1986 until 1992.